Credit to image used in pin goes to Janine. – Changes were made to the original image. Thanksgiving is one of the best holidays of the year. It’s filled with food, friends, and family. And If you’re someone who’s hosting the dinner, I know it can be overwhelming. Between the turkey, side dishes, and desserts there’s a lot of things to take care of! 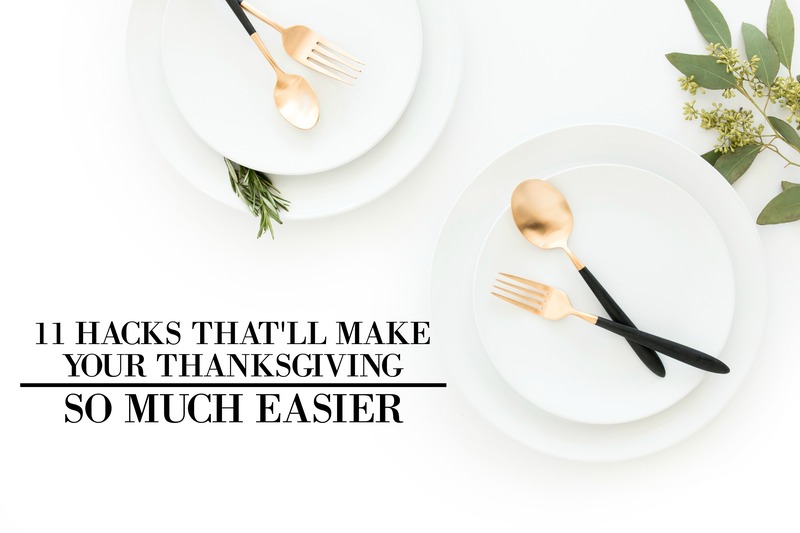 And that’s why I decided to make this roundup that’s full of great tips and hacks that will make your Thanksgiving easier. They’re are all awesome, easy to do, and will make sure your holiday planning goes off without a hitch. So check them out and let me know what you think! Sometimes turkeys tend to get dry in the oven, but thankfully there’s a hack for that! Make the main dish tender and delicious by shaping foil into thick a ring to keep the turkey elevated while cooking. This is a super simple and smart tip. We all know how annoying it is when the white meat of the Turkey gets dry. So try icing down the turkey breast before roasting so the white meat doesn’t cook faster than the dark meat. Now everyone won’t be fighting for the dark meat! For convenience and a better crust, prepare your pies ahead of time and freeze them before baking. No need to create more work for yourself on the day of! If you have a lot of potatoes to wash, put them in a dishwasher and let it clean them for you. They’ll also be easier to peel afterwards. To keep your mashed potatoes warm when every burner on your stove is in use, simply put it in a slow cooker. Set the temperature to low and remember to stir it every 30 minutes. Anything that you can prepare ahead of time reduces the stress of cooking holiday meals and saves you so much time. And this tip is pretty impressive because you can store gravy for up to 3 months in the freezer! If you’re having a large sized Turkey for Thanksgiving dinner, save up your fridge space and use a cooler to brine your turkey. This will give it the same result as a smaller turkey! Put your garlic cloves in the microwave for 15 seconds and then hand-peel the garlic after. The casings will easilycome right off! Whether you directly pour the warm broth or dip pieces in the broth, your overcooked turkey will become moist again. Now you don’t have to worry about dry meat this Thanksgiving! In case your bird starts to brown too quickly or burn, this tip from Buzzfeed is a great solution. You’ll just need a sheet of foil and cover up that area. The shininess of the foil tent helps reflect heat away from the turkey, which means it won’t cook as quickly. Genius right? Once you’ve finished making your gravy, just pour it into a thermos and pour it into a gravy boat once the rest of the meal is on the table. That way you don’t have extra things to warm up before Thanksgiving dinner. Preparing dishes for Thanksgiving dinner should not be a complicated and time-consuming task when there’s plenty of hacks that you can do to cut your preparation and cooking time in half. Implement these clever tips in your Thanksgiving planning and let me know what you think!